Time to replace your roofing shingles? As a roofing contractor I find many of today’s Houston Texas homeowners considering stone coated metal roofing shingles as a roof replacement option. A good many of Texas homeowners in the southeast Houston Texas metro area realize that replacement of their composition asphalt roofing shingles needs to be done every 10-15 years. If you are a homeowner in Texas, “I need a new roof” is as common as “I need an oil change”, well almost. Because of the intensity of our hot South TX UV rays (ultra violet rays), the standard composition petroleum based asphalt (tar) roofing shingles become baked and brittle over time baking in the hot Texas sun. If you look closely at roofing shingles, they will begin looking like a road map of Texas with cracks and lines going in many different directions. What is occurring is the protective granules, common on composition roofing shingles, become loose and often ending up in gutters or on the ground. As the shingles lose granules, it leaves the petroleum based asphalt (tar) naked and exposed to more UV rays thus accelerating the deterioration of the roofing shingle leading to leaks and phone calls to roofers for roof replacement bids. 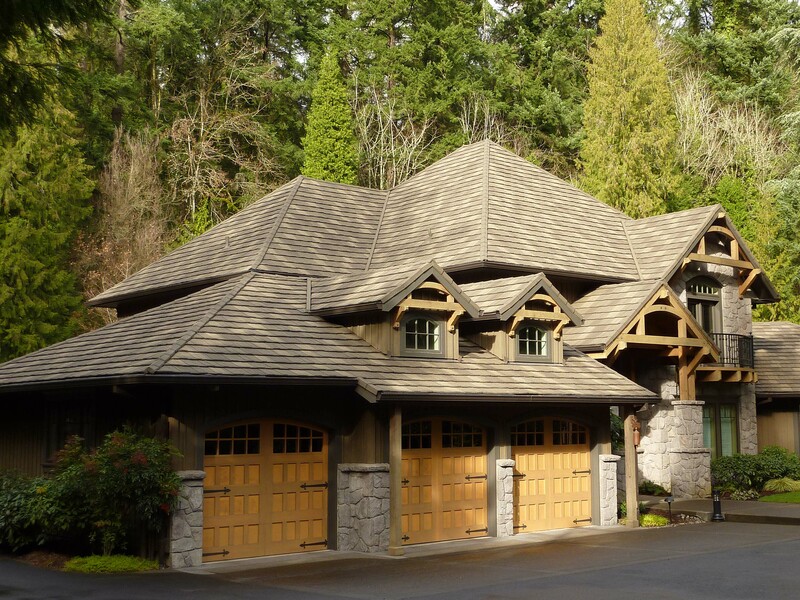 Instead of getting yet another composition shingle composition roof that will last 10 – 15 years, it may be time to consider a stone coated metal roof option. Below is a quick bulleted list of facts as to why a southeast Texas homeowner way want to consider Stone Coated Metal Roofing Shingles over traditional roofing shingles. 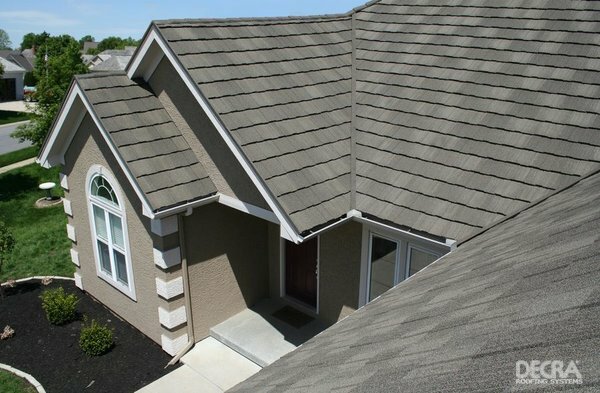 Stone coated metal roofs reflect much more of the solar radiation that is usually absorbed in your attic and home with standard composition petroleum based asphalt (tar) roofing shingles. Here in Texas, granular coated metal roofing systems not only reflect solar energy but also cool your home by re-emitting most of the solar radiation instead of absorbing it. In southeast Houston Texas annual cooling loads dominate, a highly reflective and highly emissive painted metal standing seam roofing or stone coated coated metal roof is by far the most optimal way to reduce energy consumption from your roof. These reflective roofing shingles and can re-emit up to 75% of absorbed solar radiation (heat) that otherwise would have been absorbed into your attic and into you homes interior. Composition roofing shingles are aesthetically pleasing however they only go so far from a thickness and depth perspective. That is because standard asphalt roofing shingles can only be so thick due to the fact that they are petroleum based and have almost NO structural value. 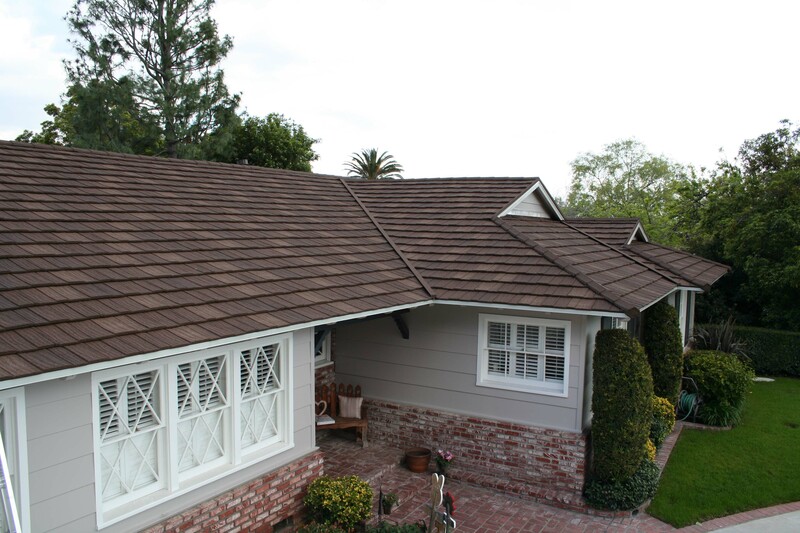 Stone Coated Metal Roofing Shingles have a Steal Base with PLENTY of structural value. Having said that, the flood gates are wide open for any creative roofing shingle style imaginable because metal roofs have lots of structural value. 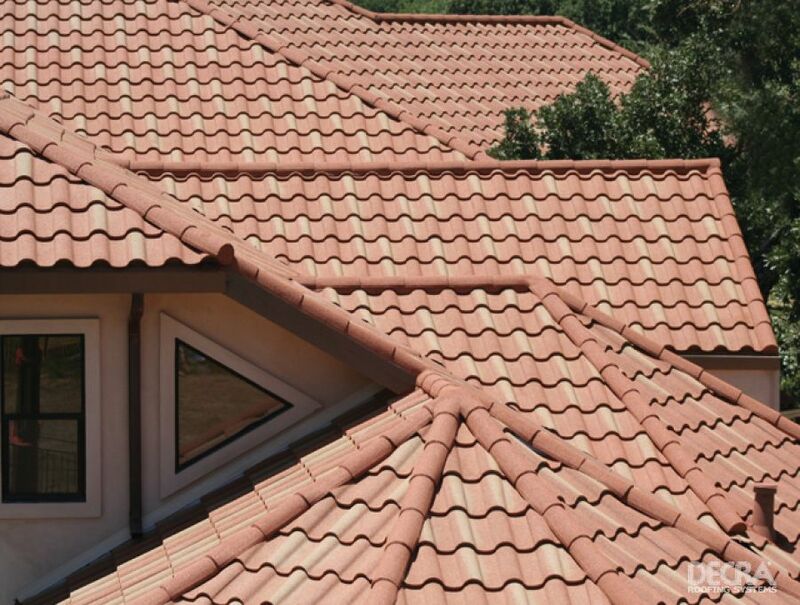 You can now have a Stone Coated Metal Roof with a variety of looks like Terra-cotta, Spanish Tile, Mediterranean-Italian Tile but without all of the weight and drawbacks of tile roofs and at the same time, all of the benefits of Stone Coated Metal Roofs. Roofing shingles that were once limited due to thickness now are granted the freedom to express themselves. Now roofing shingles can have all of the dimension homeowners want thanks to the steel base and protection of the steel being covered with mini crushed stone can create any color you can imagine! When you drive up to any home in the southeast Houston Texas area you will notice two main things on a home, the roof and the siding on the home. Often the roof has composition roofing shingles. Why not be the envy of your neighborhood and maybe even the first to take advantage of an energy efficient stone coated metal roof? I cannot tell you how many homeowners have expressed to me how much better their home looks with a metal roof, how often they get complements and improved efficiency. Homeowners realize 15-25% energy saving every year while also enjoying the peace of mind of not having to change their roof for over 50 years! This entry was posted in Energy Efficiency, Home Improvement, House Shingles, Houston Texas, Metal Roofing, Re - Roofing, Roof, Roof Shingle, Roofing, Roofing Contractor, roofing contractors, Roofing Shingle, Texas Home Exteriors, The Woodlands Texas and tagged Energy Efficiency, home improvement, houston texas, Metal roof, metal roofing shingles, roof options, roof shingles, Roofing, roofing contractor, roofing systems, stone coated metal roof, stone coated metal roofing, tile roof. Bookmark the permalink. The article has truly talks my interest. Thank u for your wonderful article. I got a clear idea about stone roofing.